are not paved with gold." "Oh Jonas!" said Carl Erik. He smiled at his little brother. "That is just something people say. It means America is a rich land." "Will we be rich?" asked Jonas. "Maybe not rich," said their father. as we did in Sweden." It is the fall of 1868. Carl Erik and his family have just arrived in New York after 12 difficult days on an emigrant boat. They are thankful to be on land again. But they still have a long hard journey ahead - first by "emigrant train," then by steamboat, up the Mississippi River. None of them speak English. They have never traveled before. Much of what they see on the way is strange - sometimes even dangerous. Not everyone is kind to them. Carl Erik's father had been warned. His money is sewn into his coat lining. But will that be enough? came out in the fall of 2007.
more than 50,000 Swedish emigrants landed on America's shores. Most went westward to claim free homestead lands. Many settled in Minnesota. Their journey across the country was long and hard. They were packed into so-called "emigrant cars" attached to slow trains, the worst the railroads had to offer. Because they didn't speak English, all the changes, delays, and sidetrackings were impossible for them to understand. Crews were often rude, and there were many accidents. First introduced in The Long Way to a New Land, a Swedish immigrant family must now wend its way from New York City to Anoka, Minnesota. While the journey to this land of opportunity is not easy, it offers hope for a new beginning - a recurring theme skillfully interwoven into the easy-to-read text. The perspective is always that of the two young boys - Carl Erik and his younger brother Jonas - so that the introduction of factual material seems both logical and necessary. 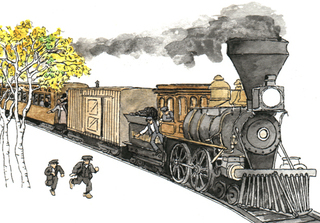 Thus, young readers will readily appreciate Jonas's amazement that 'the streets of America are not paved with gold,' the boys' wonder at the red plush seats in the first-class railway car, their longing to run beside the slow-moving train during what must have seemed an endless succession of days. Trials and tribulations are not minimized - the crowded 'emigrant' cars, the greed of earlier arrivals who would gull naive newcomers, the discourtesy of many railroad employees. However, positive elements are also included, particularly the concern of the Swedish community as manifested in the work of organizations such as the Svea Society in Chicago. Well-placed illustrations effectively interpret the action. A map of the family's journey is thoughtfully placed as part of the title page design. An excellent supplement for primary grade social studies, the book should not be overlooked as a good selection for recreational reading. With their parents, Carl Erik and his brother made their way from Sweden to America in Sandin's The Long Way to a New Land. Here the family travels from New York to Minnesota. Historically accurate, the story cronicles a typical journey which was made by more than 50,000 Swedish emigrants in 1868 and 1869...The illustrations, well-executed black-line drawings washed with color, do much to establish the mood and setting...This is a story that will attract competent primary-grade readers and will be equally suitable for less able readers in intermediate grades, especially those studying the United States and its immigration. 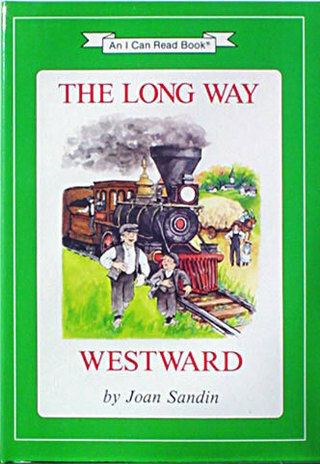 The Long Way to a New Land and The Long Way Westward are companion books that chronicle a family's journey from their Swedish farm, which is suffering from an extended drought, to a new home in Minnesota. The books describe the difficulty and dangers of the journey in a way that is non-complaining and full of optimism for a new life in America. Teachers, these books are wonderful for integrating with other subjects and topics, such as immigration, westward expansion, steamships, trains, geography, and American life in the 1860s.